Call it facelift is you must, but the "new generation" Mercedes-Benz E-Class range has just lobbed into Oz with a bold new look, gutsier and more efficient engines, richer updated interiors, higher levels of standard equipment, better value and a raft of cutting-edge tech that brings (albeit very limited) autonomous driving to local terra firma. It's a direct response, Merc-Benz says, to customer wants of more aggression, power and technology in their Es. The buff new exterior styling is anchored by the new front end and those one-piece LED-based headlights that, with their various ‘modes’, retain the so-called “four-eye face” (Merc’s words, not ours). The jury is out on fresh look and you’ll no doubt make your own mind up about the design. It is, however, a more convincing look in metal than it is in pictures. By the time mighty 430kW/800Nm E63 AMG S lands in September there’ll be seven sedans and three Estate wagons to choose from and every model under the $249,990 king bruiser gets an AMG-styled exterior sport package, lowered stance and twin-exhaust treatment as standard. The entire range has a subtle muscle car appeal, such is the Aussie buyers’ preference in the large primo segment, Merc says. The interior design across the range, too, is fresher, perceivably higher class in presentation and a touch sportier in the overall feel, though it no great departure from its forebear. Most of the key changes are in the details: a slick new multifunction wheel, a two-part trimmed dash, a new shifter-less console, three-colour ambient lightening lifted from the S-Class, repositioned indicator stalk, fruiter functionality from the Comand NTG 4.5 Generation 3 which now allows web browsing connectivity via iPhone or Andriod. In all, it’s slightly less want-for-nothing than the old Es. As is now an E-Class tradition, all Estates are seven-seaters fitted with reverse facing third-row bench arrangement generous enough for pre-teens that folds flat into the cargo floor. 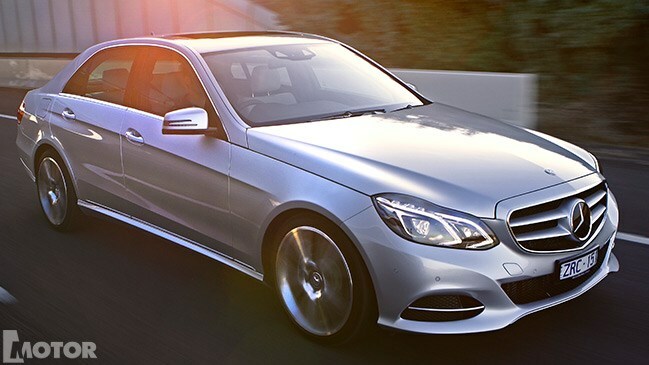 Bottom to top, the E-Class is an all turbocharged affair. The first variants off the boat are all four-bangers, kicking things off with the cheap and cheerful E200 sedan ($79,990) and wagon ($86,900), fitted with a new 135kW/300Nm 2.0-litre direct-piezo-injected turbo four that lifts outputs 20kW and 30Nm over the old 1.8-litre. The combined fuel consumption claim is pretty remarkable 6.4L/100km. For the E250, a high-power version of the turbo-petrol 1991cc engine lifts outputs to 155kW and 350Nm, up 5kW and 40Nm over the old versions, and lobs into local showrooms on sedan-only form ($96,400) on 19s, proper leather (rather than the man-made stuff in the 200s) and full LED headlights. Oiler fours are covered off with two grades of the 2143cc turbodiesel engine: a workmanlike 125kW and 400Nm in the sedan-only ($82,400) E220 CDI spec and the lustier 150kW and 500Nm in E250 CDI trim in either sedan (98,900) or Estate ($106,700) forms. The best economy claim for either engine is just 4.9L/100km – incredible frugality for large, German luxury car. As you’d expect, performance isn’t much beyond being adequate for a four-banging E-Class, though no variant struggles to get on with job. The gem, though, is the high-output oiler, its significant torque thrust throwing the 250 CDI between country backroad curves, or to anywhere from a standstill, with effortless ease. The across the range 7G-Tronic seven-speed auto is, as always, a silken and obedient partner to any engine its mated to. Bar everything running performance-style 18s and 19s, little has changed to the E-Class ride and handling packages, either in a technical sense or purely from a seat-of-the-pants perspective. It’s still points into corners confidently and is keenly balanced, though it understandably lacks degrees of sharpness, steering clarity and tautness in its body control to that of the smaller, nimbler C-Class. That said, the bigger Merc retains the superb ride comfort and bump control of its forebears. Few other luxury cars, period, can bomb across pockmarked Aussie countryside with such comfortable, pampering, fuss-free confidence. Merc reckons that the 245kW and 480Nm direct-injected twin-turbo 2996cc V6 offers comparable performance to the V8 it replaces in the E400 sedan ($128,900) and wagon ($136,700), but we’ll reserve judgment until we can get a steer of one. The move means that if you now want a bent-eight E-Class, you’ll have to foot for the (twice-as-pricey) E63, which won’t be available, it’s worth noting, in a wagon version.